It was an unseasonable 73 degrees in Kansas City on Saturday. 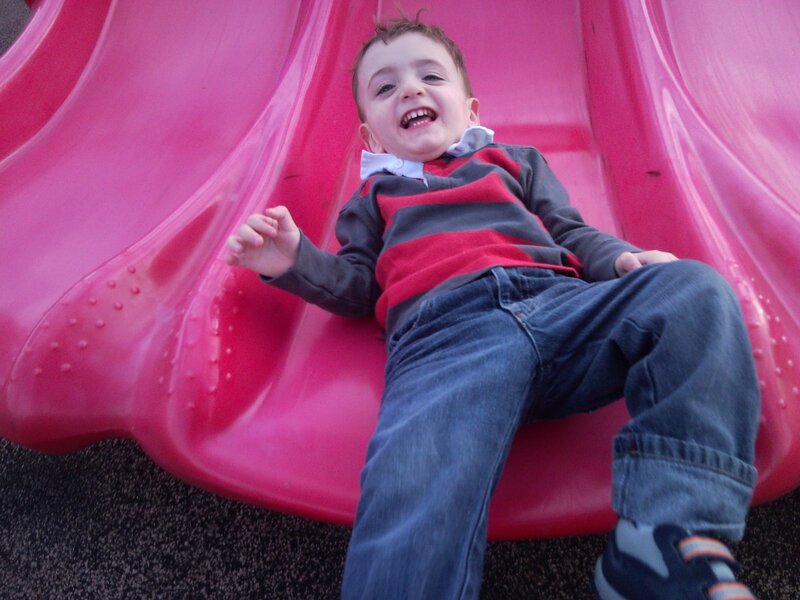 So we took Josiah out to Leawood Park – he LOVES slides – this is an action shot as he is sliding down one of the big slides. Later this month he will celebrate his second birthday – yes, it’s been nearly two years since a little 1lb 12oz baby with a bunch of medical uncertainties entered the world – and he is happy and growing and taller than most little boys his age. Loving life, trucks, fire engines and Richard Scarry books. So what about the feeding – we have had a rash of people in recent times ask how the feeding is going and asking about Los Altos feeding clinic after reading the blog. Let me deal with the Clinic first – I wholeheartedly endorse Ben Zimmerman and his work at Los Altos Feeding Clinic – he takes many of the hard cases – the NG cases that nobody else will take and he gets those kids off the tube, feeding orally and gaining weight. He is also less expensive than any of the other clinics. True we had to fundraise – but any of the other clinics would have been beyond even that and our only hope would have been insurance. Ben has a passion to get kids off feeding tubes, he has a passion to see kids eating – and for that I am so grateful. Now onto Josiah – where are we at? I (Jono) have been feeding Josiah as the main feeder 3 times a day since August. I am still feeding him. We are getting the needed calorie intake in, but it is still hard – there is no magic bullet out there – we are still doing the protocol and he is swallowing – much better than he was a couple months ago – he gets between 60g-80g of solids a feed. He will still invariably throw up everything in his stomach at the beginning of a feed – and sometimes well into the feed as well (he also has a breakfast time specialty of throwing up everything after the food and the drink – not fun). I am really so busy at work these days – many days I seem to be in meetings from 8am til 6pm. I now have a media dept of 84 folk, and also am heading up a team doing the IHOPU Distance Learning – also as the lead producer for all video content and teaching somewhat as well – it is not the easiest thing to do to come home in the middle of the day and feed the boy as well as feeding him at 7am and 6pm – but despite the hardness of it – it is good as well – it is a good time to invest into my little boy – I hope in time he will look back at this season as a time when I truly did have a Daddy time with him, along with the playing with the ball, (which involves me throwing or kicking a football, Josiah running to get it and coming back with a smile and one of his few words “Da da”). I am also grateful to be taking a little of the load from Shari – we have had two miscarriages over the past few months and the feeding issue with all parents (at least all ones we have met in connection with the clinic) is an emotional one – you feel helpless and in a degree of emotional desperation if you can’t feed your kid and you tend to blame anything or anyone. I have seen parents blame Ben for not fixing their kid completely – while I can understand their emotional response I will not do this as I believe we are seeing improvement and we will continue to see improvement in his eating. 2 Responses to Nearly Two Years Old….